I do realise this five-night getaway was a while ago now. But sometimes life in general takes control and I get so caught up in day-to-day tasks, that I forget to write and keep this blog up-to-date. So here it is. Finally! So it was our second holiday since moving to Edinburgh, Scotland and we decided to go to Germany, specifically Munich. Because J loves his beer and so he really wanted to go try some in the city famous for its beer halls. 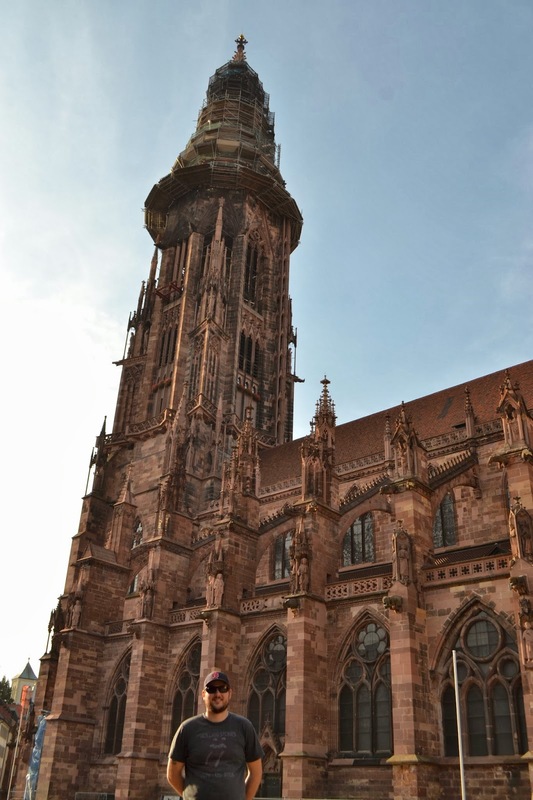 And I wanted to visit Freiburg im Breisgau, as my Nan Ruth used to go on holidays to visit her Aunt somewhere near there when she was a little girl. So that was that, with not much budgeting going on we bought tickets anyway. We flew to Munich in the morning from Edinburgh (via that notoriously cheap airline ryanAir) to Memmegen West, basically as far out of the city as you can get. Naïve travellers that we sometimes can be, thought we would be arriving at Munich’s big airport but instead arrived at Memmegen West. Which entailed us getting a bus that cost €19.50 each to get into Munich, instead of catching the local S-Bahn, that you probably can get from the main international airport. Anyway we arrived at the Wombats hostel, where we were staying for the next three nights. After putting our stuff down in our six-bed dorm and fixed ourselves up, we went for a walk with the free map the receptionist gave us. Since I’d only been there once and all I can remember of Munich is the one beer hall and Marienplatz, and since I drank so much that time I couldn’t remember where the beer hall was that I had been to and since it wasn’t dinner time yet, the latter is where headed…Marienplatz. Marienplatz; the main shopping street in Munich is adorned with a beautiful town hall Neues Rathaus and its Glockenspiel, where when the times strikes 11am and midday - the square stands still with tourists taking photos and people applause the clock, much to J’s irritance. We bought a couple of fresh pretzels from a bakery to snack on and walked around the corner to see where the Viktualienmarkt (an open air markets) was closing for the day, vowing to head there the next day and set up for a picnic. Instead of heading back to the hostel though we found on our map how to get to the beer hall: the Hofbräuhaus and headed straight there for dinner instead. Hofbräuhaus; a Bavarian state owned beer hall, quite expensive compared to many other beer halls in Munich and probably one of the most popular sites in Munich with tourists, is also a place where Hitler gave one of his earliest speeches. As it is full of other tourists, it was hard to find a table by ourselves, so we ended up sitting with this English couple and their son. Who were lovely to talk to about Scotland and Germany. We then ordered ourselves two one-litre steins of the dark beer. Which went down well! And we also ordered pork knuckle for J and a goulash for myself for dinner. After the English couple and their son left, we were joined by an Israeli family; and J was all too happy to tell the dad about how good the pork knuckle* was, before he said he was a Muslim. So instead we told him our good the beef goulash was. After dinner was finished we headed back to hostel, played some German scrabble, before going to bed ready for the next day. We decided while eating our delicious ‘free’ breakfast at the hostel to join in on the 11am ‘free’ walking tour with the guide Ozzie. What a tour this was, a bit different from any other free tour that we had been on in Europe, J and I found it to be interesting how Ozzie ran his tour, not just giving you the basic history about Munich, but also introducing you to the city and the Bavarian way of life, so much so, that you could hit the ground running the next day; like a local. First off the tour started with Ozzie taking us into Frauenkirche, a huge church and explained how the Nazi party was started in Munich. Then we went to Marienplatz and stood in front of the huge town hall and watched the Glockenspiel at work. Then after the show, we went into the Town Hall and Ozzy talked to us about how Bavarians are different from Germans, because they have a different dialect and are also included on the Germany constitution separate from the other states of Germany. Then came the tasty part, J and I got our wish, we headed for the Viktualienmarkt for food. Ozzy got us to try a bratwurst, and you had to choose between a white and a red sausage. J got the white sausage and I had the red one and we both covered it in mustard and tomato sauce. Then Ozzy also took us to try a pickle (so many different flavours to choose from), J had a garlic-infused one, where I had the traditional sweet and sour flavoured one. Then we went to a bakery stand, where Ozzy said they had won an award in 2012 for the best pretzel in town. And we also tried their almond pastry Nuss Schleife, one of the best pastry’s we had ever tasted. Needless to say these markets were the best place to come to gather up food for a picnic. Well after food, came the drinks. Ozzy took us to a tiny little bar for schnapps, where he is a regular. We had raspberry schnapps. Which gave a nice buzz on afternoon tour. Then after schnapps we followed Ozzy into the Hofbräuhaus, where he finished telling us about the rise of the Nazi’s and also the Beer Hall Putsch. 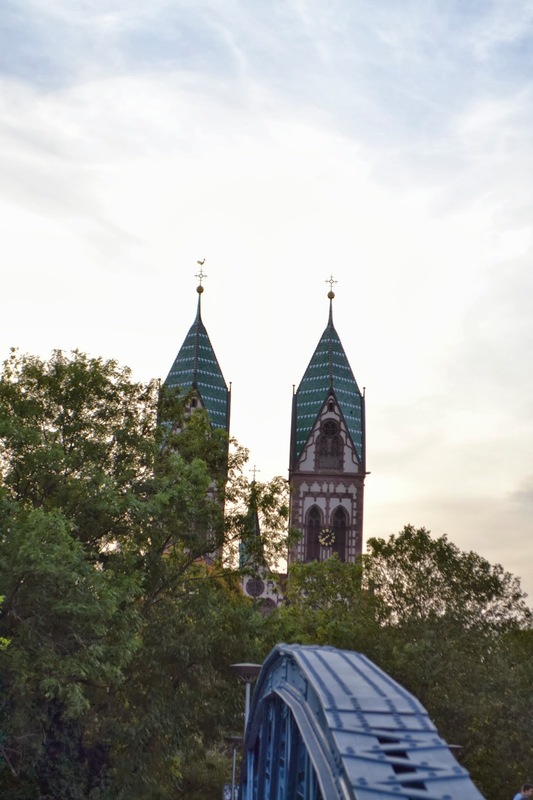 After walking past the Rezidenz, Ozzy finished standing under the shade of the Feldherrnhalle, in front of Odeonplatz, where he thanked everyone for coming along and hoped that we enjoyed it. And here came the awkward end to a ‘free’ tour. He basically said if he took your hand then you gave him what he thought his tour was worth. Then he would tell you where to stand. Three English guys got told to stand far away and the Ozzy told us why. A friend of his who he stopped to talk to at Marienplatz gave him her tip money from her tour to take people out for a drink after his tour, and it was up to him, who he found to be worthy of such a nice gesture. As she had just found out she was now in remission and wanted to thank him for standing by her through it. J and I love ‘pay it forward’ gestures like this, especially when it involves beer. What a random act of kindness all us travellers on this tour were given. So Ozzy took us to the OktoberfestMuseum, a beer hall in itself. He bought us all as taster of the three Augustiner beers; a Weiss, a blonde and dark. We then sat there and talked for ages with everyone, until one by one everyone went back to the hostel until J and I were one of the last ones left, along with two guys and a girl (from London) and Ozzy. Then we went back to Wombat’s ourselves and met up with everyone from the tour (of course there were lots of Aussies) at the hostel bar. Then we went to a beer garden, though we attempted to go to Augustiner Kellers; a famous beer hall, which we thought we had found, but it was closed. It took us awhile to find this other beer garden where we ended up. Because we were a group of about twenty, and there were three-different very headstrong guys trying to all lead the pack, with their equally great map-reading skills. At least we found somewhere in the end. We had a stein of beer and dinner each before heading back to the hostel bar to have some more beer. Fresh pickles at the markets. So waking up with massive hangovers wasn’t our best idea, with a big day of exploring Munich ahead of us, but that’s what happened. J had a hangover similar to the one I had written about in my previous story about our trip to Portugal, just minus the flying part. I even tested the strength of J’s stomach, by making him walk out of the hostel and across the main road to the chemist to get him some hydrolytes, which he managed to do until we got back to the hostel and then it was just a dash to the bathroom. Anyway, because J was unfit for sightseeing, I decided I was going to go off on my own to see the Englische Garten and some other stuff we had intended on seeing together. Until a girl from London and an Australian guy* (that I met on the tour and also had beers with last night) asked me if I wanted to join them for some sightseeing, which I gladly said yes to. First off we stopped at the open-air markets (again) for a bratwurst, pretzel and pastry (again). 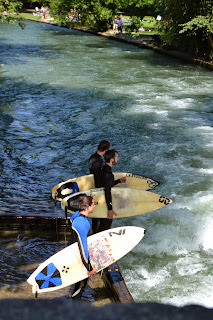 Then we headed to the Englische Garten; famous for its nudist areas, beer garden and a wave that you can surf on, yes, that’s right, somewhere in the middle of this great city, there is somewhere you can go surfing. Munich really does have it all. First of all, we walked to find this ‘wave.’ I was so amazed when I saw it, it was almost the same reaction I had when I watched Billabong Odessey for the first time. If you love surfing (or even if you don’t) its worth going to this spot, just to watch all the different people have a go at riding this man-made, fast moving wave. Then after a stroll all the way to the beer garden; the Chinesischer Turm; and back, J had text me saying he was going to meet me. When he got there, J and I walked back through the garden, passing along the way the surf spot again and passed an impressive building* and through Hofgarten and back towards that now familiar place, the Viktualienmarkt. From the markets, J and I bought these hedgehog statues, a sweet and sour pickle for me and a pretzel for J and we went to the honey shop there. Afterwards we built up the energy to climb the stairs of St Peterskirche, for a €1.50 each, its probably the cheapest view of a city in Europe that J and I have had the chance to see. And it was such a gorgeous day, so we got a pretty decent view, the only problem was that because it was such a hot day, the haze on the horizon blocked the view of the alps. Then we went back to the hostel, had a rest, then got changed and finally headed to the right AugustinerKeller beer hall, after thinking it was this one that was closer to the hostel and closed on our first two nights. So we were thankful we found it on our last night in Munich. We had such good food there too, J had a pork schnitzel (not very traditional in Bavaria), but my dish was the best thing ever; a 200g roast beef with deep fried onion and spätzle in a gravy sauce. It was so delicious. And then came dessert, which we shared – a pastry bun with vanilla ice cream and custard. Early in the morning we quickly paid a visit at those same farmers markets again – to get pretzels and nüss scheifer for our drive to Freiburg im Breisgau. After checking-out of Wombats, we walked over the road to the train station to meet Jens, the guy we found on carpooling.co.uk, who was giving us a lift from Munich to Freiburg in his car. It was a new experience for J and I, but we thought we’d give it a go after my friend Rachel told us about it. It can save you a lot of money, especially in Germany where the trains to go cross-country can be quite expensive. This trip, which ended up taking six hours in the end, cost us only €42 for both J and I, cheap compared to the €90 each we were going to pay to catch the train. In saying that the carpooling website can be used to find cheap bus and train rides as well. Anyway, Jens didn’t end up being a ‘crazy-axe murderer’ like those thoughts in the back of my mind were conjuring-up for him to be, he was however a mid-20’s med student studying at the Munich university, who was on his way to pick-up his little brother from Freiburg, so they could go to France for a holiday together. It still does catch you by surprise, when you meet someone from another country, and you find out that they have very similar interests as you, like music for example. Well that’s what J and I found with Jens. A lovely guy, he even drove along the scenic route for us, instead of on the normal highway, where we went past Lake Constance (Bodensee in German), which borders Germany, Switzerland and Austria. Which was so beautiful, I wished we thought of going there on holiday. After a beautiful drive through hops country in Bavaria and then Lake Constance and part of the Black Forest, we arrived at Freiburg im Breisgau after six hours (which took longer mainly due to the traffic coming into Freiburg). Jens dropped us off at our accommodation that was described as, 'Klara-Apartment - zentral & cosy' which we found on airbnb.com, where we were greeted by the owners boyfriend, who nicely gave us directions on how to get into town. We put our stuff down, rested and then headed out. We found a café and had a coffee and cake, then we walked around town and looked at the shops and the Münster, a 700-year-old cathedral. We then tried to find the tourism office so we could get information on going to the Black Forest. I ended up having to ask a lady in German for directions, which she gave to us in German*. Which we understood, and we found the office just before it closed and gathered up some brochures about heading into the forest. Before heading back to the flat, while we were walking through the cobblestone laneways, we passed a bottle shop and decided to buy a local bottle of wine, as the region around the Black Forest is famous for its wines. So we bought a bottle of white wine and a bottle of Black Forest cherry schnapps that the owner of Thomas Daiber Weinfachgeschaft makes himself. Drinking the wine we bought, and eating takeaway Italian food, whilst sitting on our own private balcony, watching the sunset was a good way to end the day. To start the day, guess where J and I went first…yes, that’s right, the farmers markets in Freiburg. Which are nestled right under the Münster, in the centre of town, and where we bought cheese, breadrolls, salami and luncheon meat to eat for lunch*. But we couldn’t leave the markets that morning without a taste of a bratwurst of some kind; J and I both had a ‘rindwürst’ (a crispy skinned sausage), and gosh it was tasty. Then we were off back towards the flat, to go to the main train station to head to Titisee, a small town - West of Freiburg - situated next to a beautiful lake in the Black Forest. It took 30-minutes on the train, so not far. And wow was it worth the trip. Not having ever been to a lake in Europe, J or I, we thought it was beautiful. We headed straight to the shore, before we found a place where could go for a swim. And there was one, one that you had to pay to get into, but that also had a swimming pool as well. Unusual practice for us (having to pay to get into a ‘lake’) but common practice for Europe, as it designates a spot on the lake, so as to keep environmental disturbance at a minimum. After finding a shady spot and digging in to our German gourmet picnic, we found a spot in the sun to lay our towels and lay in the sun, before we headed to the waters edge to jump in. Unsurprisingly, the water was icy cold. And it took me about 30-minutes to get used to the waters temperature, before I was brave enough to dunk my head under the water, much to J’s amusement. Then it was back to the flat and back to finding somewhere for dinner. Since we were in Germany, J had been hanging out to have a kebab. And so we did. Which was delicious, especially after a day lying in the sun (such a hard life we lead). What a way to end our last night in Freiburg, but to have more wine. So after walking around the twisting cobblestone laneways, we found probably the most beautiful street in Freiburg with vine covered buildings and the whole length of the street had the tiny medieval canals (bächle in German) running along it and where we found a discreet bar – Altstadtlokal “Alter Simon,” where J sampled a few more of Germany’s finest beers and I, the local white wine; Gutedel trocken (Baden) and Müller – Thurgau trocken (Baden). J and I thought it was a shame that we didn’t get to spend more time in Germany. Especially me, I wished we could’ve seen more of the Black Forest. Hopefully we will get the chance to go back one day. After catching the shuttle bus from the main train station, we arrived at the EuroAirport, a unique experience for both J and I, as this airport is shared by Freiburg, Germany – Basel, Switzerland and Mulhouse, France. So in order to get to your boarding gate, you have to go through Swiss customs, which meant J got a stamp in his passport. Which he loved. *A place where you could struggle with the food (if you’re anything like me or worse a vegetarian) as they do eat a lot of Pork. Which I don’t really eat, but I do love bratwurst. * I really can’t remember their names. * Which we couldn’t figure out what it was called, or what it was fall. * This was unfamiliar to us, because if you ever go to Paris, Spain or France, most people if they notice you’re having trouble speaking to them in their language, you’ll find they’ll speak back to you in English. But in Germany, they don’t. The only person that spoke to J and I in English was an Italian man when we were ordering food. But when he knew I could speak some Italian, he spoke back to me in Italian. * One of the best ways to eat around Europe, is to often find the local food markets and buy stuff to make up a picnic lunch. It was a great trip! I hope you get to go to these cities one day and if you need any travel tips just ask.